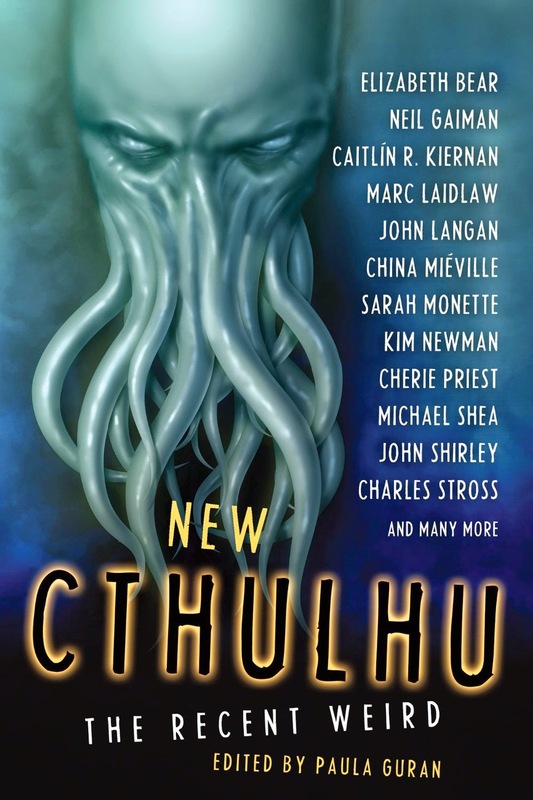 I enjoyed New Cthulhu: The Recent Weird, edited by Paula Guran. She made a very good selection of stories. None of them was out and out bad, which is usually the case with Cthulhu fiction. "Lesser Demons" by Norman Partridge wasn't the best, but I reference it because as a short story, it was much better than the whole The Strain trilogy that's coming out as a t.v. series soon and was analogous. Evil stuff shows up, guy has to fight it. Pretty straight forward. Except for once it's not vampires or zombies, but Cthulu-esque monsters and infection. I read The Strain series back in 2012 just before I got hurt. The idea that it might have been the last thing I ever read still bothers me. It read like it was set up for a tv show or movie. Apparently I'm not the only one who thought so. I liked Steve Duffy's "The Oram County Whoosit" which read like a western tall tale. And I'd read "A Study in Emerald" by Neil Gaiman before, a mash up of Sherlock Holmes and Cthulhu where the royal families are the monsters returned. It belongs in any good collection. I was startled to see references that were in the first episode of BBCs Sherlock, meaning I obviously have not been a particularly voracious Holmes reader during my life. "The Essayist in the Wilderness" by William Browning Spencer was my favorite. The idea that a pretentious English major would know so little about nature that he'd leave strings for himself to find his way home and would have no idea that crayfish would strip off their shells to dance while appendages wobbled on their backs is amusing. That they'd snap each other together and apart like jigsaw puzzles to make bigger crayfish and then hunt frog sacrifices in order to share the organs, the best crayfish getting the frog skin to wear like a little cloak...well, that's pretty creepy. And when they start to dance in the pest control spray, they definitely have a Cthulhu quality. Mieville's "Details" was interesting in that echoed a very specific HP Lovecraft theme about cracks and corners being dangerous entry points into the beyond. However, Kim Newman's "Another Fish Story" struck me as more like his writing, coming right after "Details" in the collection. "Another Fish Story" involved a sort of Cthulhu anti-Christ who was angling (ha - fishy) for a slow death for humanity by all the ills afflicting modern society. Because of his desire for a particular lingering hell for humanity, he was making deals to derail other possible hells, like a merfolk/Ia flooding of the West Coast. Charlie Manson makes an appearance, as does Lon Chaney, Jr., who I knew almost nothing about, but the details of his personality are spelled out pretty well after looking at the Wikipedia biography. The story definitely had aspects of Perdido Street Station or The Scar. "Mongoose" by Elizabeth Bear and Sarah Monette was science fiction where there was bleed over from the Cthulhu dimensions. Enjoyable. And "A Colder War" by Charles Stross posited an alternate cold war/history where the great powers had discovered the great powers from beyond and were trying to harness forces they didn't understand and couldn't possibly control. Analogous to the real cold war and nuclear weapons. A good diversion, but I'm excited to get back to something with more substance. As an addendum, here's an amusing story I saw from Fail Blog today about a book store (Waterstones on Oxford Street) with a Necronomicon problem. [Waterstones' Twitter Feed].